Kanger T3 Review: Top Features, Ratings, Pros & Cons! Home → Clearomizers → Kanger T3 Review: Top Features, Ratings, Pros & Cons! Something tells me that the folks over at Kanger never sleep…just about as soon as you arrive home with your latest vaping system from Kanger, another upgrade hits the shelves. With the launch of the new bottom coil clearomizer systems from Kanger, you’re probably wondering whether it’s worth your while to pack away that old T2 and give the new design try. That’s why I’m here! With this review, I’ll share my experience sampling the new bottom coil systems. I’m hoping that by the end of it you’ll know for sure whether it’s worth your while to upgrade. Seeing as the Kanger T3 release was followed shortly by the Kanger T3S, a similar bottom coil clearomizer with a few small design changes, I’ve also included my Kanger T3S review for your benefit. If you’re new to vaping or just unfamiliar with Kangertech, they’re a popular, trusty name in vaping, constantly expanding and improving their range with affordable, high performance products which have been providing serial vapesters like myself with many a flavored cloud for quite some time now. It’s always a pleasure to sample their new setups and I’m excited to get started with this T3 review so come along…let’s blow off some steam. I must say, I’ve been pretty impressed with the design and value for money I got from both products and that’s why, in this Kanger T3 Review (with the Kanger T3S included) I’ve awarded a steamy 4.5 Star rating. Well done Kanger! Before I get started on my actual Kanger T3 Clearomizer Review, let me just cover the bases, as well as the differences between the T3 and T3S. Unlike the Kanger T2 Clearomizer, both the T3 and T3S are bottom coil systems, with fixed mouth pieces. I tend to enjoy the bottom coil systems more because I needn’t fill up as much and I find that the mouthpiece area doesn’t heat up as quickly. Both have 3ml tanks but fill up to about 2.4ml and come in a pack with five replacement tanks at under $18. The key differences with the T3S is the clear plastic look on the mouthpiece as well as the three piece design, which makes replacement a little more economical. The T3S is a three piece so instead of having to replace the base and coil head when your cartomizer burns out, you can just screw on a replacement cartomizer. Both pieces are eGo threaded but can be fitted with an adapter to run on a 510 battery. The Kanger T3S clearomizer has a capacity 2.4-3 ml, which should give you at least 800-1000 hits. The basic T3S pack, comes with 5 Cartomizer replacements. Voltage: 3.2 - 3.7 V.
Length: 70 mm x Diameter 14mm. Looks: I realize that performance is really what it’s all about but I’m a big fan of the sleek, straight design and I love the look of the grip on the skirt covering the threading…it makes for a more expensive look, even though it’s a really affordable piece. I especially like the look of the T3S with the clear mouthpiece, although it’s important to keep it clean. 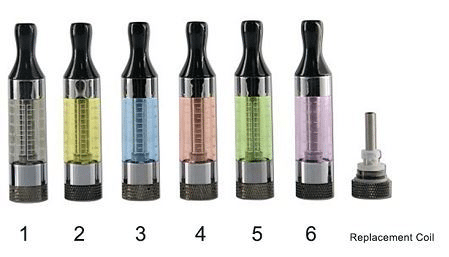 The T3S Clearomizer comes in a great range of stylish colors and you can match it up to just about anything. Bottom Coil System: Now, if you are a heavy vaper like myself, taking a lot of deep hits in quick succession, then the bottom coil system is definitely going to be a better bet for you. The bottom coil not only prevents the upper parts from heating up so quickly, it also means fewer dry hits and minimal tilting necessary, a big plus. If you do happen to experience a dry hit issue, unscrew the base and remove the coil head to expose the wicking, now you’ll see a couple of wicks probably just lying on top of the coiled wick, if you remove one of them this should apparently take care of the problem (remove the second one if the problem persists) but having never had an issue with on my T3’s, I haven’t tested this fix. Refill: Because of this being a bottom coil system, you unscrew at the bottom of the tank when you’re ready for a refill. Instead of having to avoid pouring juice in the centre shaft (which, quite frankly, irritates the hell out of me), you can just insert your nozzle into the hole and fill away. The T3S tank also has clever gradation printing which allows you to see how far your tank is filled no matter which way around you’re holding it. The bottom fill system also results in less leakage. Quality Of Vape: I filled up with some Banana Cream from Cloudberry and got toking on both pieces. I found no difference in the quality of vape between the two models as the T3S modifications don’t really affect that. Easy airflow, a lot of good flavor coming through and a rich, clean vape. I’m very impressed with the performance and only found that the vape started becoming warm after a number hits and then just a light warmth. Overall a very pleasant experience, no complaints. Compatibility: Well, I’m not sure that this is really a con so much as a slight inconvenience for some people. Being that this both the T3 and T3S are eGo threaded, they need to be hooked up to an eGo threaded battery, although with a 510 to eGo adapter you’ll have no problem hooking up to your 510 threaded battery. Quality, Performance and Range. At an affordable price you’ve got excellent performance, a good range of products and a quality product. Well, what can I say other than well done to Kanger for once again delivering a top notch product, a definite improvement over the T2 system and a much improved, flavorful vape. I’m impressed with the looks, design and affordability of the T3 range and I can honestly say that new and old vapers who decide to invest in either one of these babies won’t be disappointed, although I obviously advise you to go for the T3S because of the economy of replacement parts. From me, over and out and happy vaping!